As the recent revolutions in the Middle East have demonstrated, civil society in this part of the world is on the move. The increasingly important role of non-state actors – a phenomenon of globalization- has characterized developments throughout the region, affecting the struggle for democracy and for peace. This volume brings together scholars primarily form the region to analyse the varied activities and contributions of NGOs, the private sector and the new media, from Morocco to Iran, along with the involvement of diaspora groups. The chapter on facebook in the recent Egyptian revolution captures the role of this new media while the study on similar technology in Iran outlines the barriers raised by the authorities in the current struggles there. Even the fledgling process of democratization in Saudi Arabia is driven by non-state actors while the veteran women's movements in the Maghreb serve as an example for the post-Arab spring era in those countries. 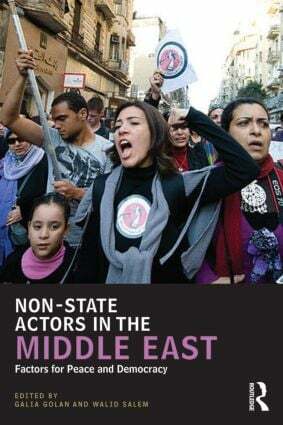 Providing one of the first assessments of the role of non-state actors in the Middle East, this book will be essential reading for students of Political Science, Sociology and Civil Society, amongst others.